People who’ve been in the trucking business and around heavy equipment for a long time know what’s tough. They can just look at a piece of equipment and with a keen eye can tell if it’ll be tough enough for them or their clients. They can see the way the equipment is designed, the materials used in the build and how it’s installed. They know the punishing environments that the equipment will be used in and the unforgiving conditions that tradesmen will put them through, day in day out, year after year. More than anyone else, those in the business understand the logic behind the saying “you get what you pay for”. They know; they’ve seen how trying to save a little here and there on inferior equipment can let you down in the field, and leave you stranded mid-job. It ends up costing you more in time, money, and professional reputation to replace broken equipment and get the job done. Rob DeMars, Director of Sales for ABI Truck and Van Shelving in Rockwall, TX, has been around trucks, heavy equipment, and tradesmen for a long time and he knows high-quality equipment when he sees it – his reputation and clients depend on it. So when Rob wanted to offer a line of storage solution products to upfit a variety of commercial vehicles, he chose Ranger Design. 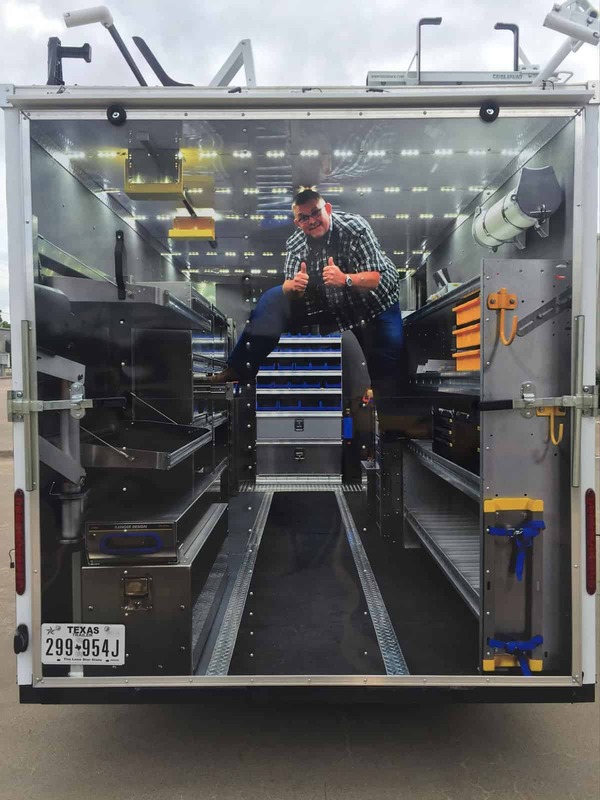 Rob’s knowledge and experience told him that Ranger Design aluminum trailer shelves and tool drawers were engineered and built with the strongest materials, making them the toughest in the business and that he could represent them with pride and confidence. 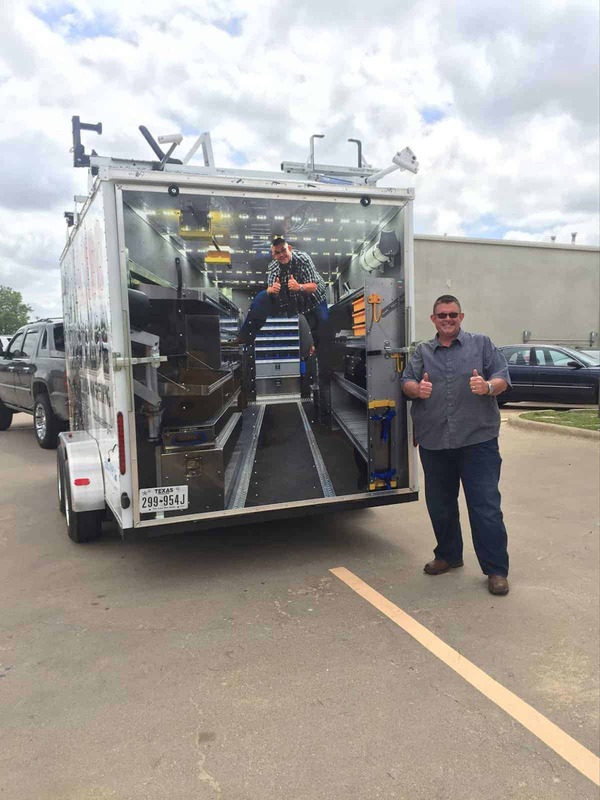 Rob has upfitted a 16ft cargo trailer exclusively with Ranger Design products that he brings to clients for demonstrations. Rob doesn’t just talk the talk, he walks it … or should we say he climbs it. To show how strong Ranger Design cargo trailer shelves and drawers are, he climbs up and stands on them during his demos and amazes his audience. Once you understand that Rob is a big man (350lbs) then you realize how strong those aluminum shelves are and what kind of positive impression it leaves. Rob’s been in the business for a long time and is very familiar with the competition and he says that he would never have tried this demonstration with other brands. People are so impressed that they tell Rob that if they hadn’t seen it themselves, they wouldn’t have believed it. This gave Rob the idea to have a picture taken of him standing on the shelves and extended tool drawer. He then had the back of his demo trailer vinyl wrapped with the photo proving that a picture is worth a thousand words. Ranger Design aluminum trailer shelves and storage bin systems are unique in the industry. By combining the strength and rigidity of either steel or aluminum extrusions with a laminated (solid substrate) shelf base, you get a shelf tray that is strong, quiet and very durable. Most Ranger Design shelving systems are contoured by using curved end panels and different depths of shelves. This allows the units hug the wall of the vehicle and maximize the floor space. All shelves include rattle free dividers are designed to be repositioned to allow a custom fit for all your tools and equipment. All shelving systems are available in a large selection of standard sizes and use a solid drill free attachment system. To make it easier, Ranger Design has created trade specific packages for all popular cargo vans get them quickly upfitted and into service in no time. Poor quality tool drawers eventually jam, sag, and won’t latch properly, that’s why Ranger Design has engineered a rugged, durable drawer system that works. Built with high strength materials the tool drawers have an amazing capacity of up to 320 lbs. If you’re looking for exceptionally strong equipment for your tough working environment, then contact us at Ranger Design today. All of our products are backed by an industry leading warranty and world-class customer service. One of our product specialists is standing by now to answer you call at (800) 565-5321. You can also contact us or request a quote. I have always been good at what I do, but Ranger Design Products have made it easy to be great at it. Thanks for the support and fantastic equipment.